The year is 1812. It was a long, heated political season throughout the northeast, and Massachusetts Governor Elbridge Gerry had just signed a bill into law to remap the state senate election districts. The opposing Federalist Party is gaining popularity, and Gerry and his party members couldn’t hold power the way the districts stood. So, they redrew them. 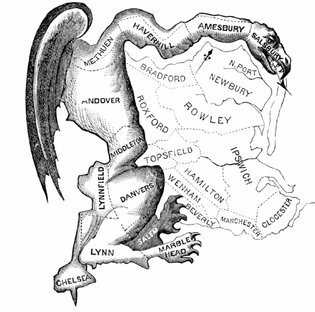 On March 26, the Boston Gazette ran a political cartoon showing the shape of one of the new districts in the Essex South state senatorial district. It is serpentine and wrapped around and between other districts. The new district divides up territories so that even with rapidly dwindling support, sitting Democratic-Republican senators were able to keep their seats. The shape of the new district reminded people of a salamander with it’s long, snake-like body, so the portmanteau “Gerrymander” was used to describe this. The paper was run by Federalist editors Nathan Hale, and Benjamin and John Russel, and they are believed to have coined the phrase. The plan works. Even with a loss of both the gubernatorial seat and a majority in Massachusetts House, the defeated Gerry ensures that the state senate would continue to be controlled by his party. This would allow the Democratic-Republicans to stonewall efforts by the Federalist Party for years. 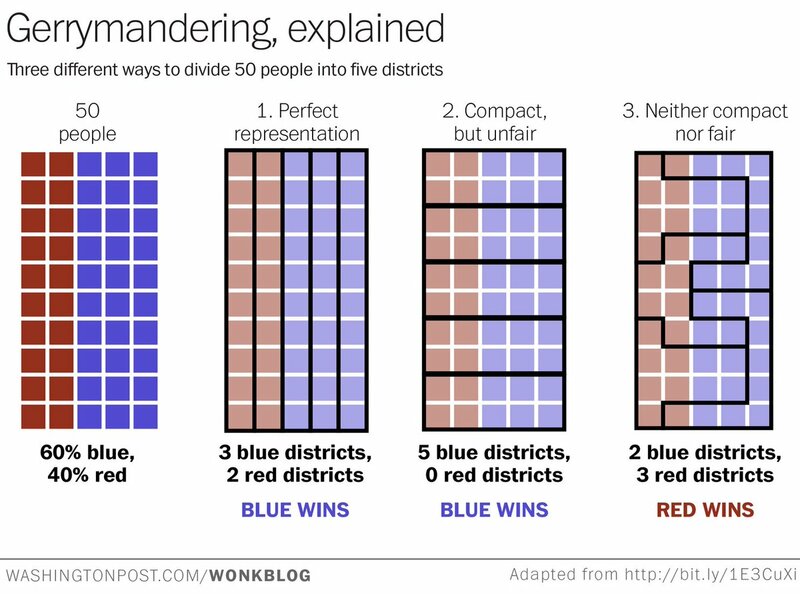 Gerrymandering is a controversial process of the U.S. political machine that gives an unfair advantage to one party or candidate over their rivals by selectively ignoring population density and equity of representation. But how and why does this happen? How are these districts created? Every ten years, a national census is conducted. The data collected shows migration patterns and population shifts across the nation. Since the existing law only allows for 435 congressional districts to represent the population of our country, new maps are drawn up to reflect this fluctuation in population. States with increased population gain districts, from states where population declined. In many states these district maps are drawn up by a committee formed of lawmakers from the party that holds the majority. These maps are then brought before the legislative body for a vote. Some states delegate these responsibilities to an appointed commission. But the how and why of this are two very different things. How it occurs in each state depends largely on the demographics of the region. 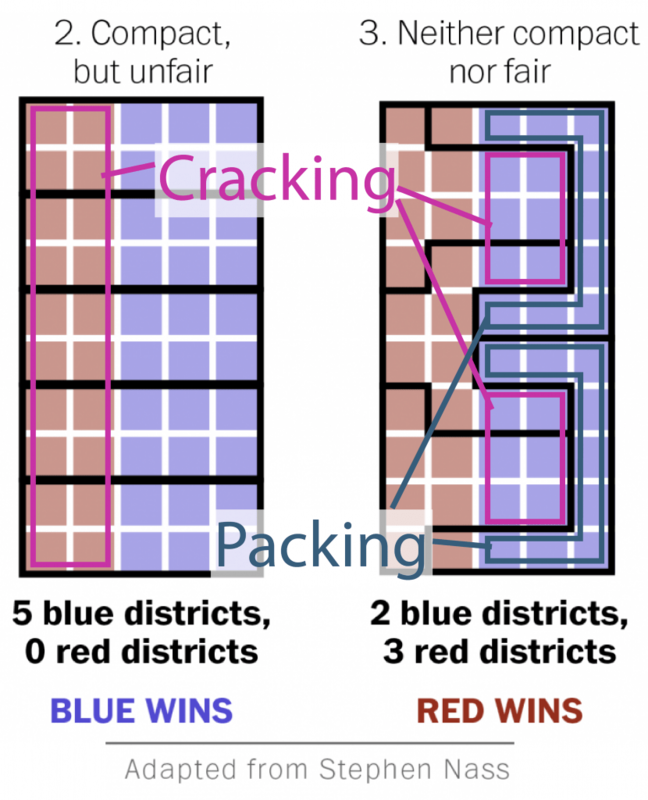 Gerrymandering takes the form “cracking” or “packing” constituencies; based on ethnic, political, economic, or regional differences. It violates the 14th Amendment and invalidates the very nature of democratic representation. Cracking is done by thinning out one particular demographic of voters amongst multiple districts, making it impossible to garner a sufficiently large voting body in any individual district. This is most easily seen in Columbus, Ohio, where the urban concentration of liberal Democrats located at the center of Franklin County, is divided into thirds. Each segment attaches to a series of much larger conservative suburbs that favor a conservative Republican vote. Packing aims to focus as many voters of a single demographic into a sole electoral district, to reduce their influence in other districts. California’s 23rd congressional district was drawn up to evenly disperse voters of the Democratic Party along a slender band of coastline. Following the 2010 census, the district was redrawn by a non-partisan commission. California is one of the few states that has taken steps to reduce gerrymandering. The result of these careful machinations is that the party responsible for the skewed gerrymandering will win in a large number of districts by a very small margin, and lose in a few district overwhelmingly. This allows even an unpopular politician or party to retain control, and protects incumbent legislators from challenge. Gerrymandering is the single greatest threat to our democracy. It is the reason why Congress has such an abysmally low approval rating, yet only 8 out of 435 incumbents were defeated in the 2016 election. According to the Washington Post, the average margin by which members of the House of Representatives won their districts was more than 37 percent. That means that most district elections were won with an approximately 70/30 vote. Only 33 seats of the 435 total representatives were elected with less than a 10% margin. Fully 42 of the 50 states in our country had no competitive district elections. More than 90% of district elections were decided before the first ballot was even cast. In 2010, a small group of Republican supporters, the Republican State Leadership Committee, began working with the GOP to form the (RED)istricting (MA)jority (P)roject, or REDMAP. The group collected money for elections among their supporters and donated huge sums to two specific points of leverage. First, in swing states, such as Pennsylvania and Michigan where electoral votes and a high number of congressional districts make them very attractive to party officials. Secondly, they levied monies into states that have traditionally loose redistricting laws and a Democrat-majority legislature. They did this for a single goal – to flip legislative majority in as many blue states as possible from Democrat to Republican. And it was amazing efficient in its goals. Flipping almost 20 state legislatures to Republican control, they were able to gain control over the redrawing of those congressional districts. This gave them control over more House seats, more Electoral College votes, and more legislative control over American policy. With this savvy maneuver, the Republican Party has created an incredibly effective blockade against the Democrats. Many experts expect that this will create a Republican wave-effect in elections, until at least 2020, when the next US Census is taken. Even then, it may be too late for Democrats to rally and shift the tide without considerable changes to the enforcement of legislature designed to ensure the 14th Amendment. If you vote Republican, you probably think that this is an huge win. The problem is that you’re wrong. Dead wrong. In the end, the only people profiting from this hijacking of democracy are the corporate carpet-baggers and entitled neo-conservative ideologues that the GOP are entrenching into districts unable to eject them. Not to mention that corporate oversight and control have taken a back seat in states now controlled by these tactics. Michigan (remember those swing states that REDMAP bought?) opened the region to fracking and fought for months trying to downplay the lead and contaminant content in Flint, Michigan’s water supply. Even two years after changing their water supplies, many citizens still must cook and wash with bottled water. Deregulation and lapse in policy for corporate profit doesn’t end with water contamination. Earlier this year, Hurricane Harvey decimated the lives of thousands living in Texas. It also flooded a chemical plant in Crosby, causing a series of explosions. The tanks effected were not supposed to be operating, and the surrounding mile and a half area had to be evacuated. Officials and safety experts confirm that this incident exposed a major flaw in chemical safety regulations, risk disclosure, and emergency preparedness. For what it’s worth, here’s my two-cents. Gerrymandering has to stop. It is the single greatest threat to our representative democratic system that we face today. Every other issue we contend with as a nation can be brought to heel once we set this unfortunate portion of our history to rest. This is a tool for keeping power in the hands of a select, corrupt few. It is inherently racially motivated, seeking to keep minorities from gaining voice and representation equal to their contribution and numbers. This kind of underhanded, Machiavellian scheme shows how afraid and desperate these political shills have become. It has weaponized voting, erased the accountability of the law makers, and driven us further from the vision of a representative republic than our founders could have ever imagined. It is our duty to do everything in our power to reverse this appropriation and unlawful seizure of our electoral process. Between now and 2020, we must do everything we can to remove this power from the hands of the lawmakers who benefit from partisan greed and party nepotism. Let the maps be redrawn. Let the people be equally represented. And finally, tear down the electoral college and let one person equal one vote. All That Is Interesting on October 10, 2016. 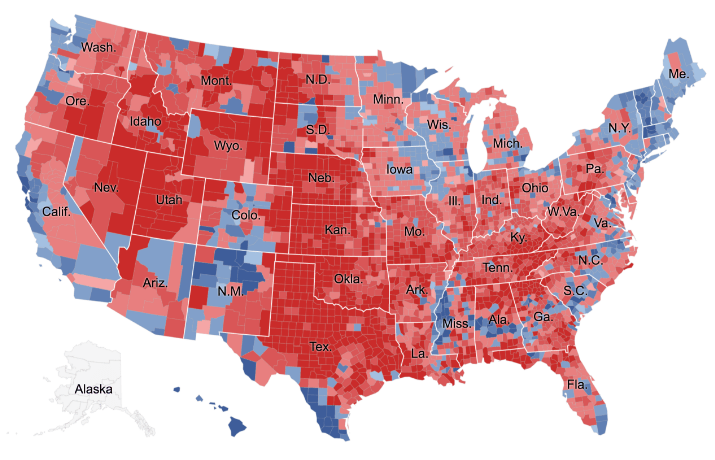 “How The GOP’s Project REDMAP Helped Them Fix Election Wins Until 2020.” All That Is Interesting. October 10, 2016. Accessed November 10, 2017. http://all-that-is-interesting.com/redmap-project. Barasch, Emily. “The Twisted History of Gerrymandering in American Politics.” The Atlantic. September 19, 2012. Accessed November 08, 2017. https://www.theatlantic.com/politics/archive/2012/09/the-twisted-history-of-gerrymandering-in-american-politics/262369/#slide1. Draper, Robert. “The League of Dangerous Mapmakers.” The Atlantic. February 19, 2014. Accessed November 05, 2017. https://www.theatlantic.com/magazine/archive/2012/10/the-league-of/309084/. Klaas, Brian. “Gerrymandering is the biggest obstacle to genuine democracy in the United States. So why is no one protesting?” The Washington Post. February 10, 2017. Accessed November 05, 2017. https://www.washingtonpost.com/news/democracy-post/wp/2017/02/10/gerrymandering-is-the-biggest-obstacle-to-genuine-democracy-in-the-united-states-so-why-is-no-one-protesting/?utm_term=.d28dc1556ee4. The Editors of Encyclopædia Britannica. “Gerrymandering.” Encyclopædia Britannica. November 05, 2014. Accessed November 05, 2017. https://www.britannica.com/topic/gerrymandering.